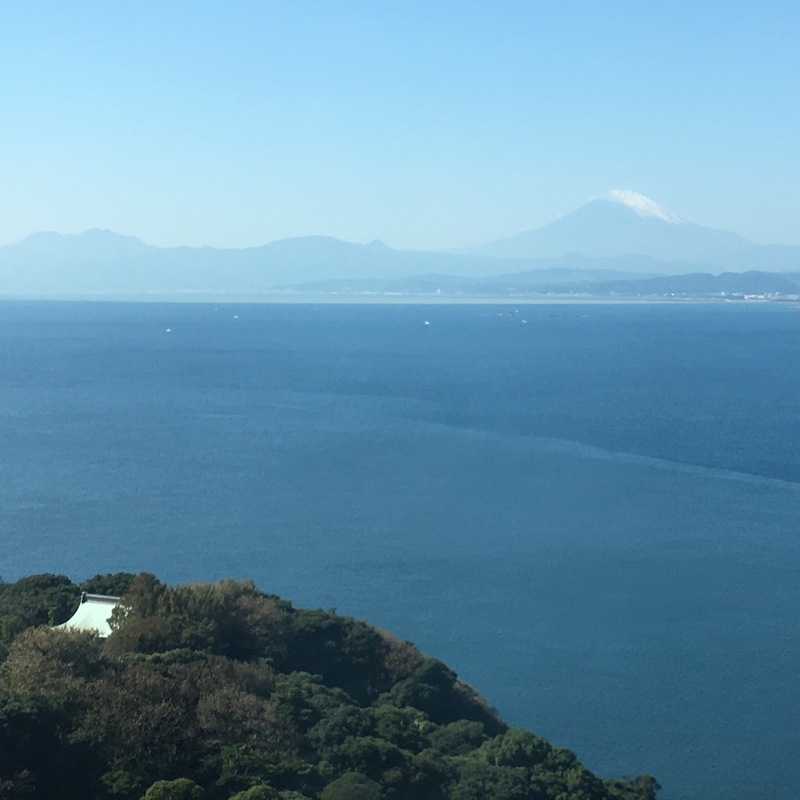 Katie and I decided to enjoy the beautiful and windy day exploring a couple spots we pass when we take the train to Enoshima Island. We decided to stop for lunch at the Pacific Drive-In restaurant. 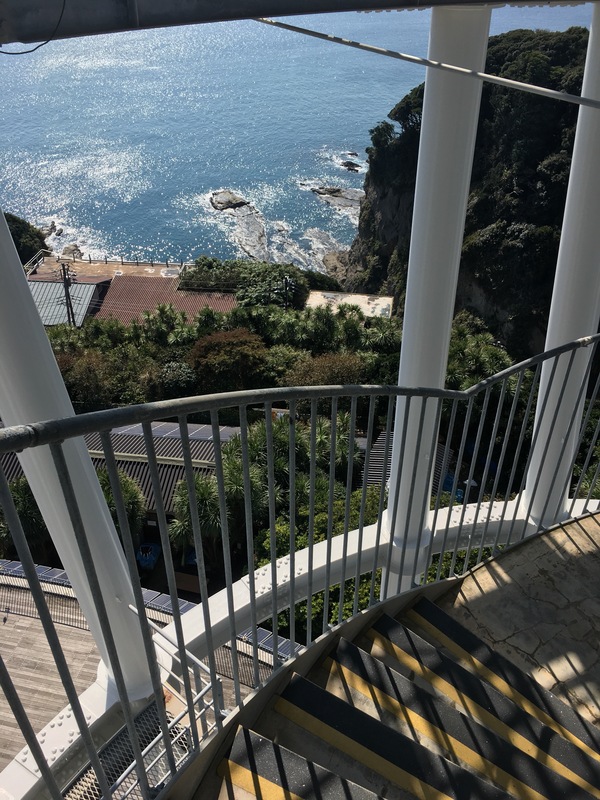 It is literally right on the edge of Inamuragasaki Beach. Check out the waves today! It was so windy!! 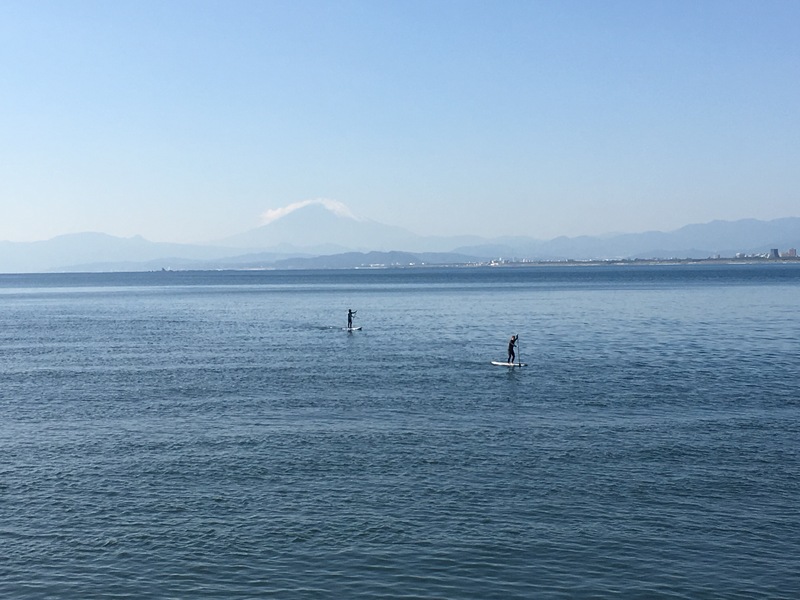 Enoshima Island is on the left and Mt. 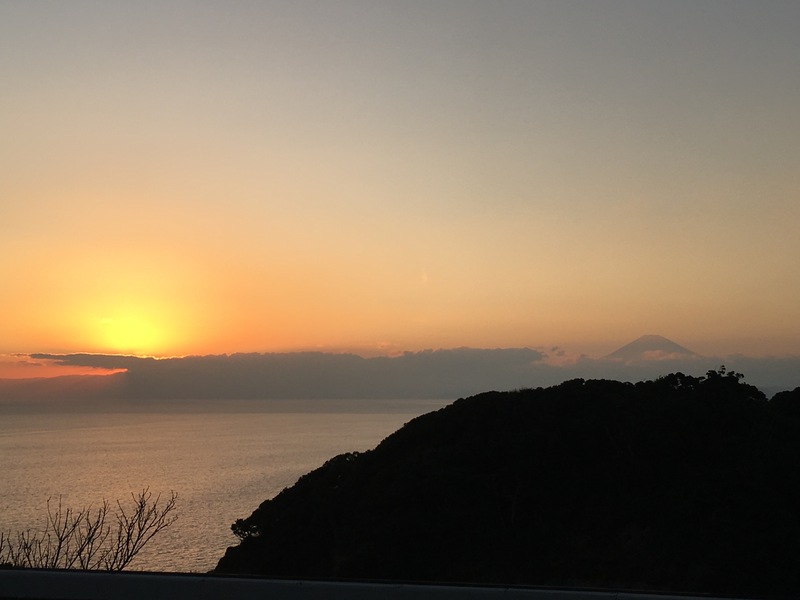 Fuji is on the right. The view from our table inside was lovely. We both ordered the ahi tuna poke bowl. It was ok. I was a little surprised it didn’t have more poke flavor. We both ended up adding a little soy sauce and that seemed to help. The ginger ale I ordered was fantastic! We decided next time to order the shrimp plate. After lunch, we walked above Inamuragasaki Beach so I could show Katie the cute park near by. Check out the daffodils already blooming! You can still see Mt. Fuji even with the cloud halo. 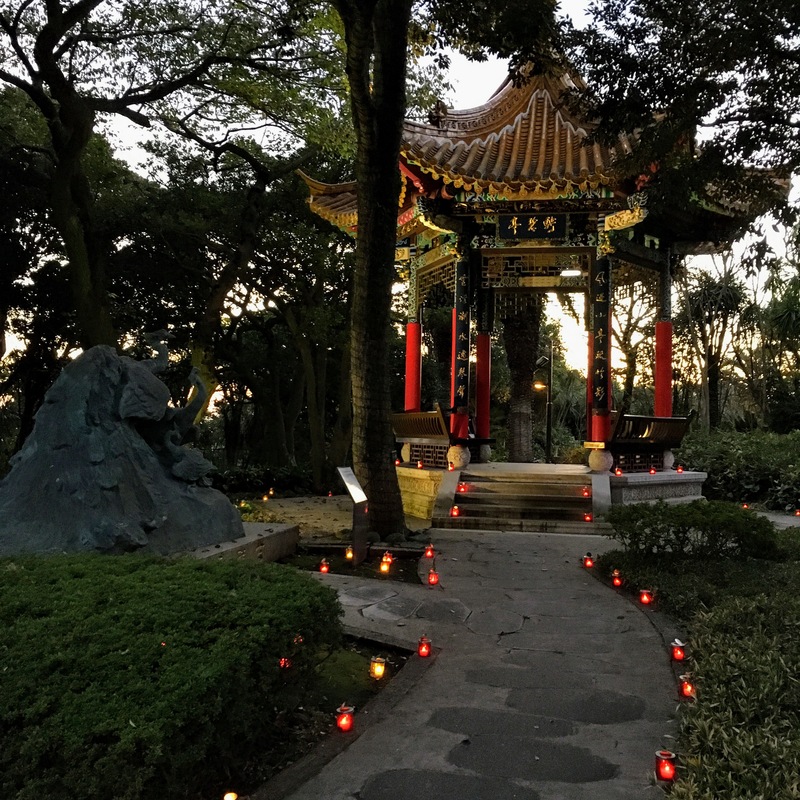 The next spot we wanted to explore was the Ryuguchi Temple. 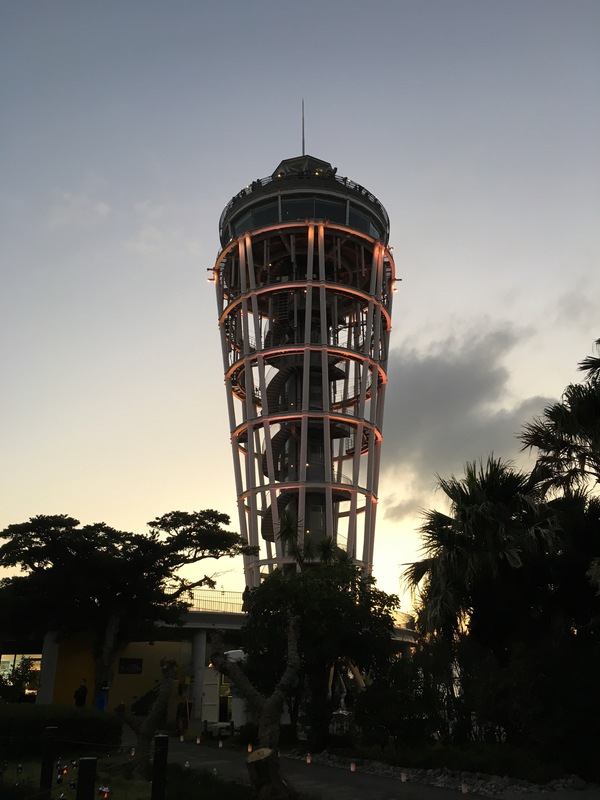 From the Enoshima train line, we can see a pagoda and we’ve always been curious. Today, we had time to explore. We took a wrong turn and found this temple with a very cool tunnel. Fortunately, Google Maps got us back on track. Literally. We were walking down the street where the Enoshima train runs down the street! 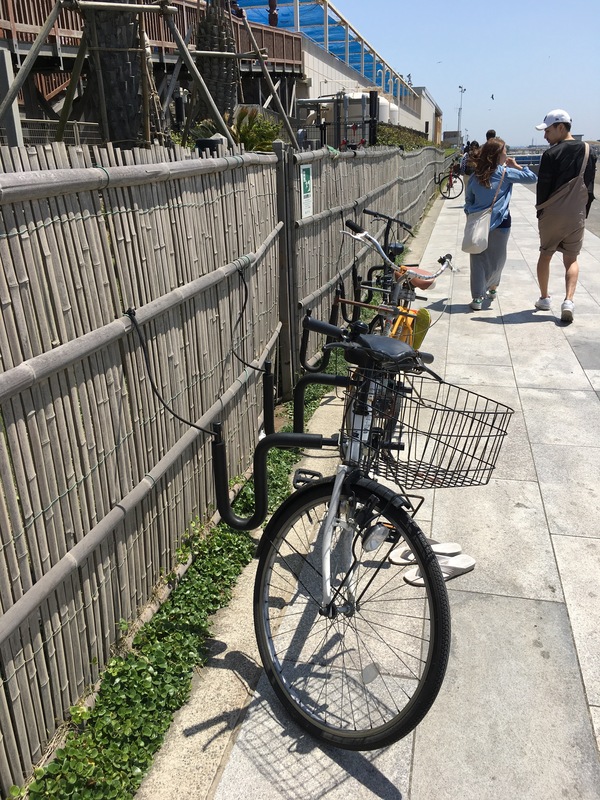 I felt like a local when I I snapped pictures of the cute Enoshima electric train line. A few minutes later, we found the Ryuguchi Temple. We walked around and up and down. Along the way we passed a Torii. One of my favorite things about Temples and Shrines is the acceptance of both religions (Buddhism and Shinto) at a single location. If only all the other religions in the world could be more accepting and tolerable, we would be a lot closer to peace on Earth. At the top of the stairs we came to a beautiful Temple with a gold Buddha. We walked around to the back and we caught a great view of Mt. 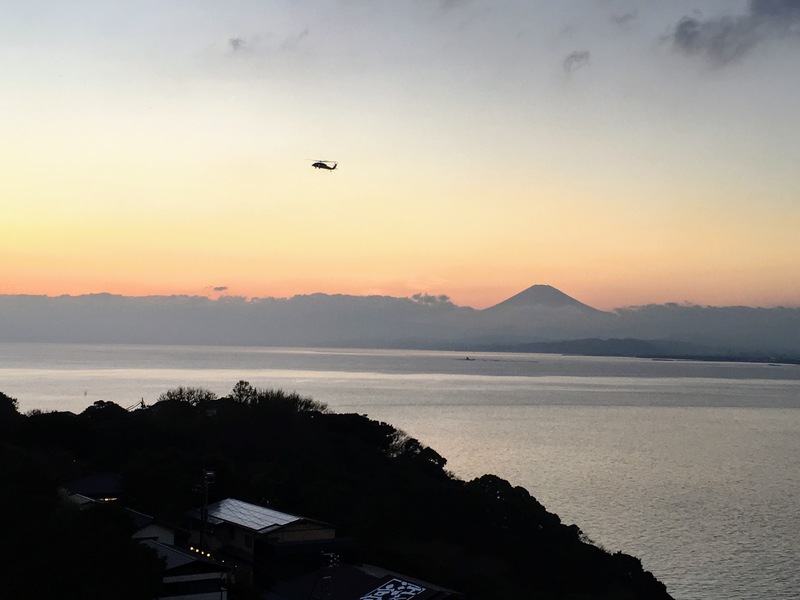 Fuji and Enoshima Beach. Finally, we came down to the five-story wood pagoda. It was nestled in the trees creating a serene environment. Despite the chilly temperatures and wind, it was a beautiful day. We had fun lunching, exploring and shopping. We might both actually be finished Christmas shopping! 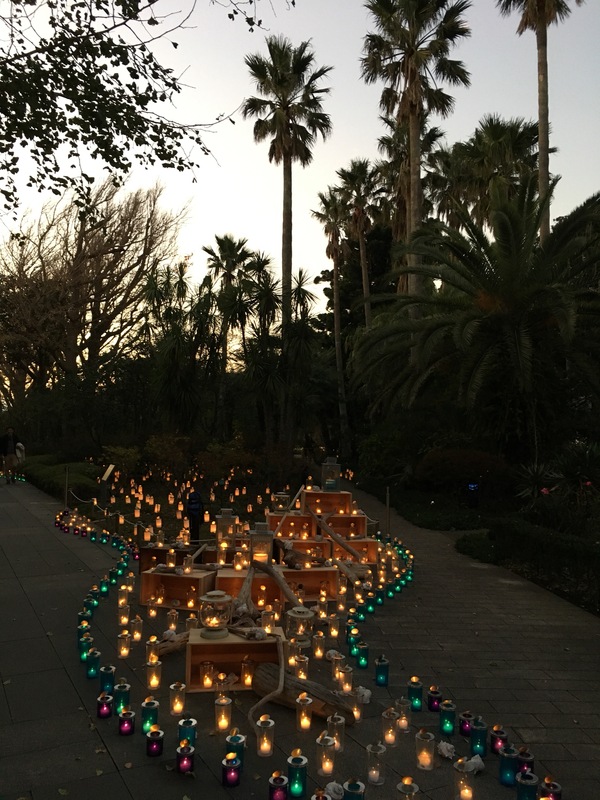 Holiday illuminations are shining brightly all around Japan. 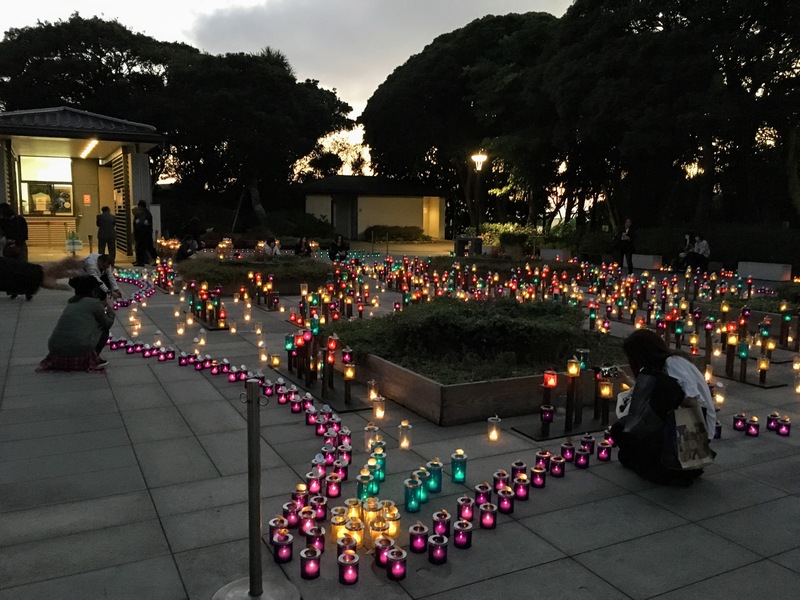 One spot I missed last year was the Enoshima Sea Candle. I decided to add it to calendar earlier and during a week day. Katie and her daughter, Virginia, met me in Zushi so we could ride the train together the rest of the way to Enoshima. We were hoping for a clear night. We wanted to see Mt. 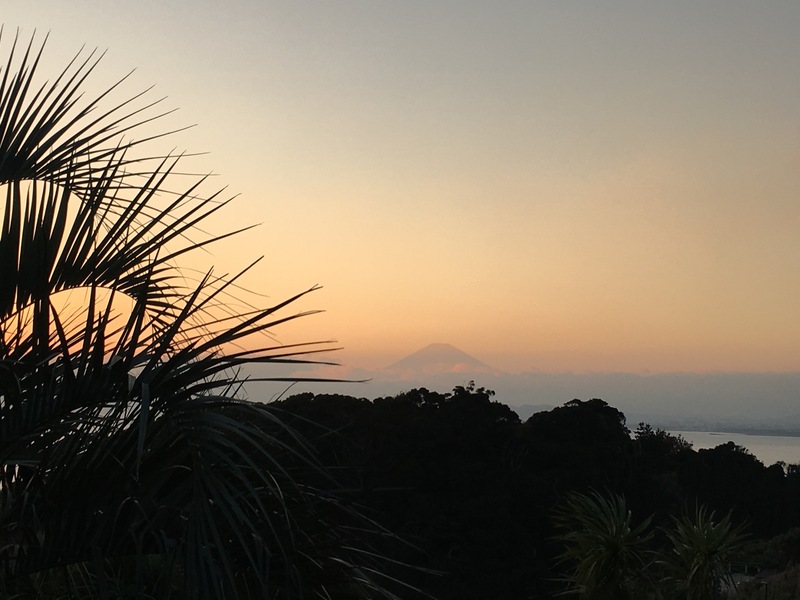 Fuji, sunset, and the super moon. Unfortunately, clouds rolled in during the early afternoon. We took our time climbing up to the top and soaked in the view as we went. I also had the chance to use my Apple Watch to take a picture of the three of us. It’s a great feature and made even easier because in various places around Japan we have seen little smart phone stands. Brilliant! At 17:00 the lights were illuminated. They made an announcement about five minutes prior and people started rushing into the garden. Right before 17:00 there was a 10- second count down and then the lights were turned on. Everyone cheered. It was really cute. 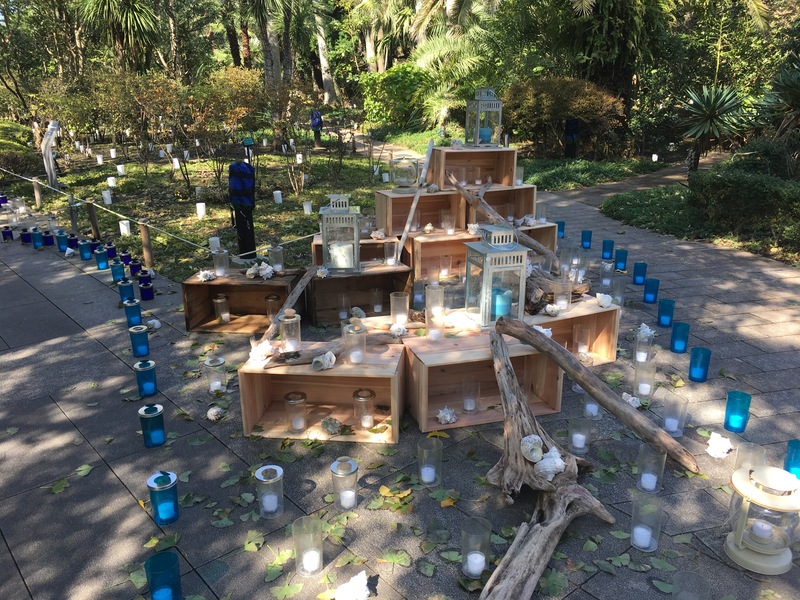 The gardens of the Sea Candle were so beautiful. It was fun to walk through and absorb the serenity of the garden. Plus, there was music playing to help set the holiday spirit. The highlight was the long light tunnel. It was so beautiful. There were large chandeliers hanging from the ceiling and crystals hanging from the sides. It was cool to see the Sea Candle through the tunnel. We walked through the tunnel a couple times. It was just so beautiful with all the lights. 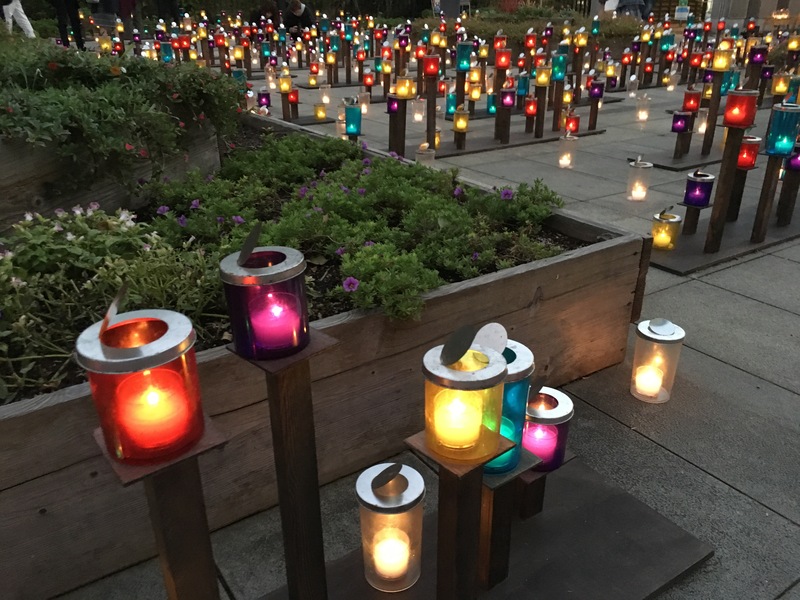 The Sea Candle was also illuminated. The view from the top of the Sea Candle was a delight as well. Our evening out was just the break I needed. I spent most of the day working on rerouting our Christmas holiday plans. We were planning a trip to Bali. Unfortunately, the ash cloud from Mt. Agung continues to threaten flights. We decided to play it on the safe side and reroute our trip to Phuket. It was a bit of a hassle to change, but worth it in the end for piece of mind. I did a little more research and found a different part for us to visit this year and enjoy a relaxing holiday together. We can save Bali for next year. Sunday was an absolutely beautiful day. 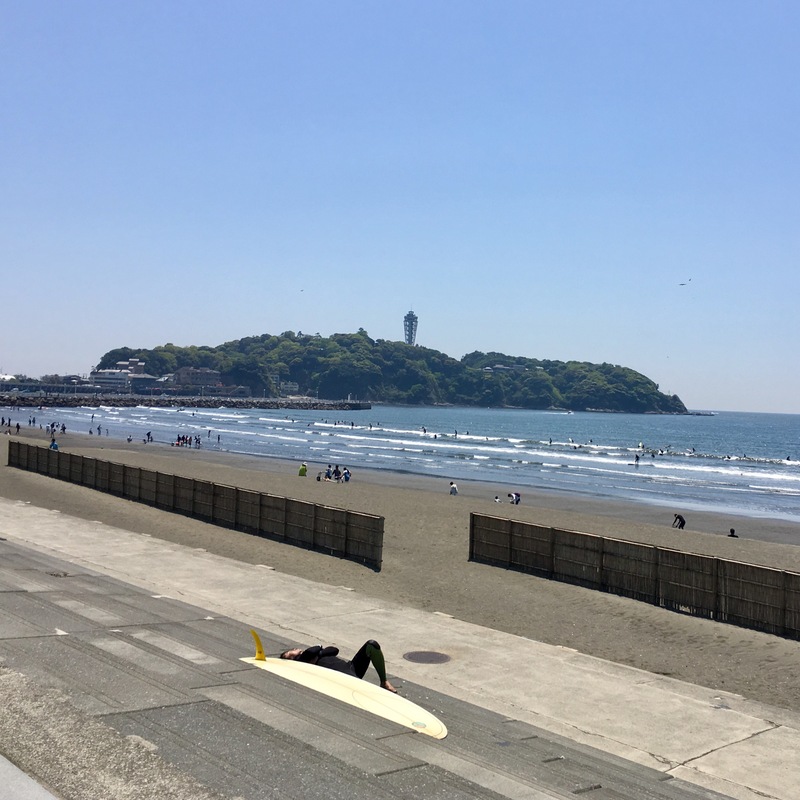 Dave and I decided to walk around Shonan Beach and Enoshima Island. When Dave and I went in January, we had amazing views of Mt. Fuji. Today we had a hazy view of Mt. 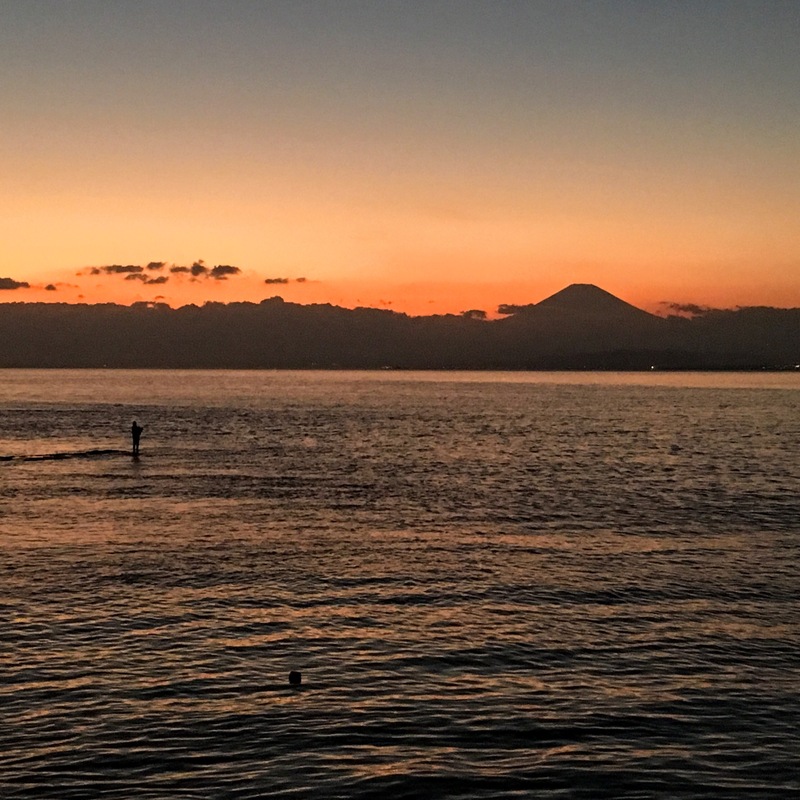 Fuji and a view of a bunch of surfers! We stopped for a burger at J.S. Cafe. 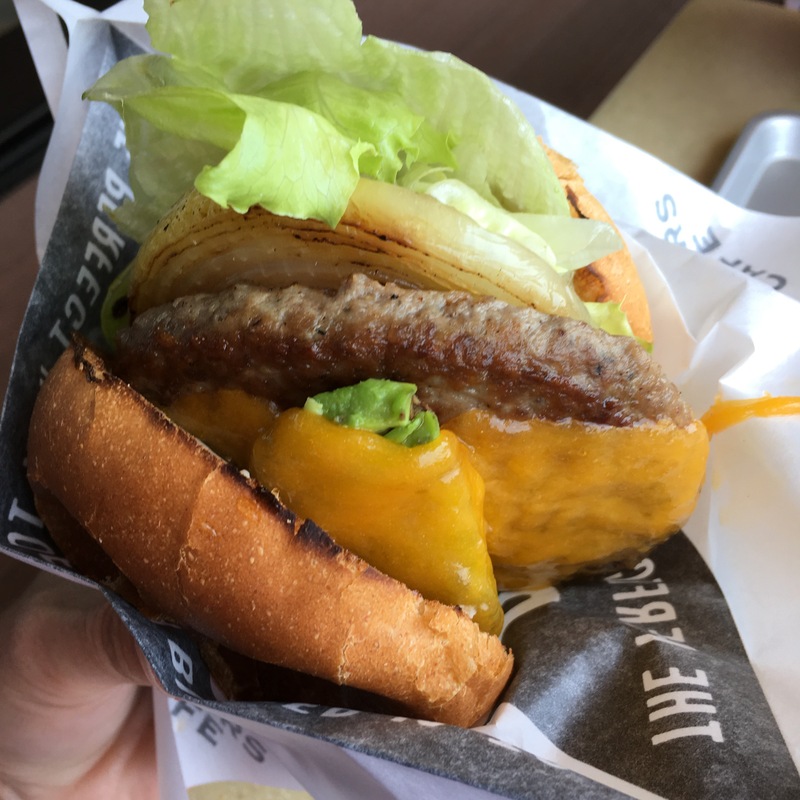 I had an avocado cheeseburger. 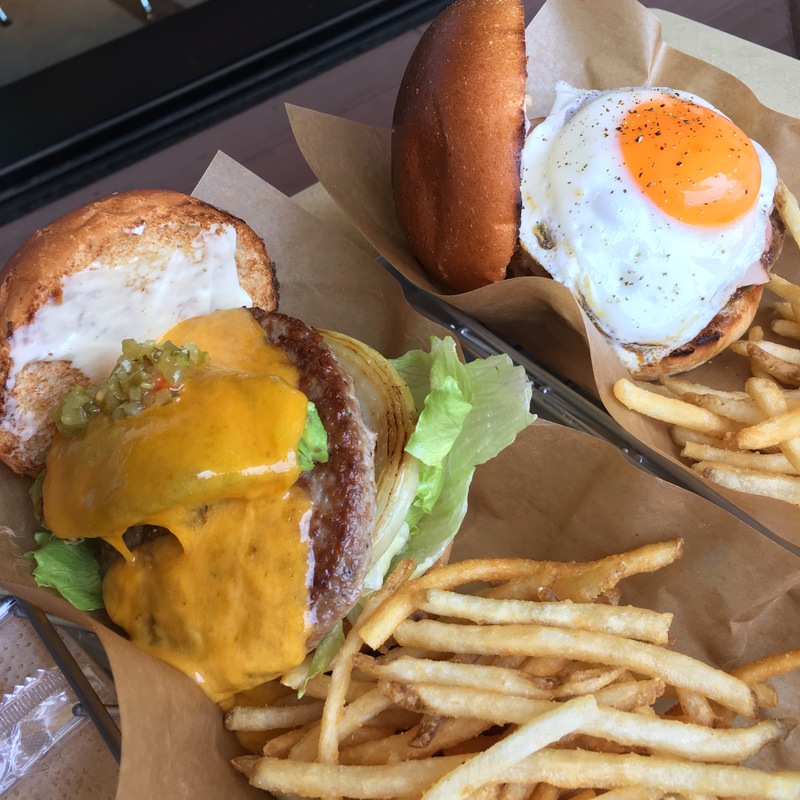 Dave opted for the sunny-side up egg and bacon burger. 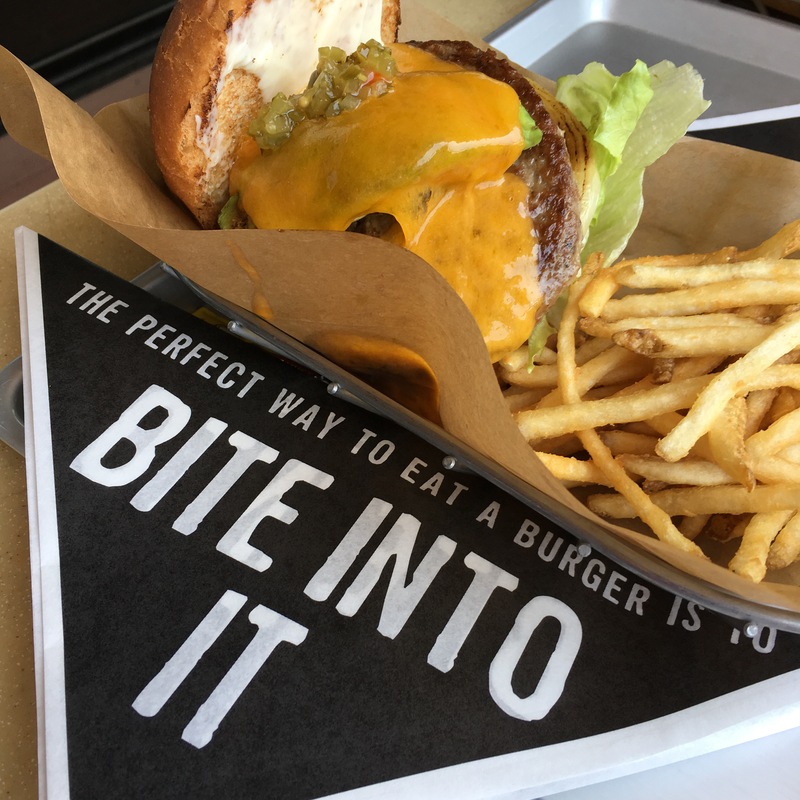 I love the advice on the burger wrapper / holder. We walked along the beach after lunch. It was fun to be back in a beach scene. 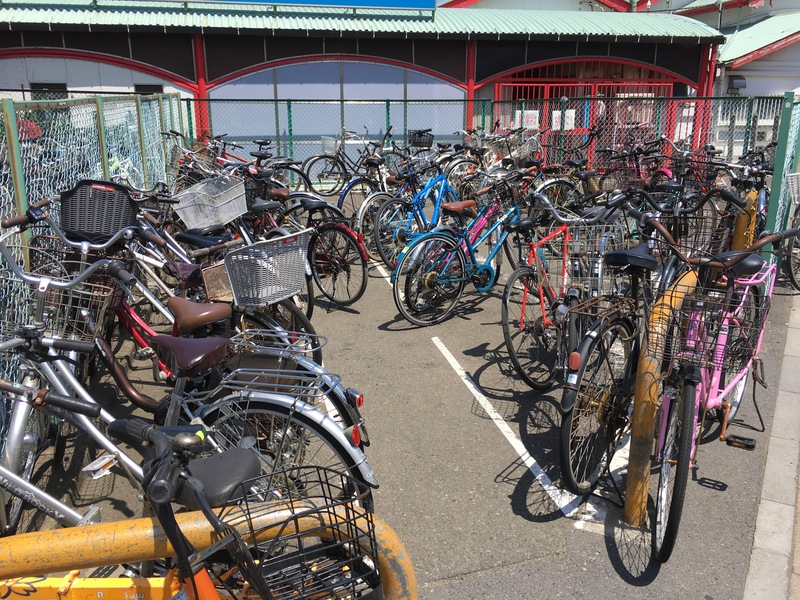 One thing that remains the same about a beach town – bikes! 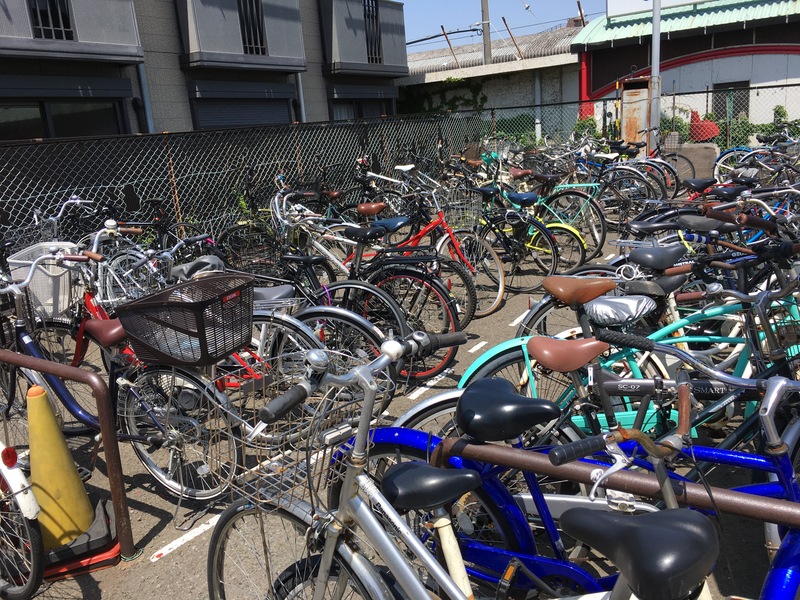 So many bikes! This picture reminded me of our friend, Mark, in Virginia Beach. As a surfer, he transits to and from the beach on his bike with his surfboard. I looked for him in the water today. Saturday started Golden Week. A little research helped me better understand the holiday period. The four holidays between the week of April 29 through May 5 were established in 1948. The way the calendar falls in 2017, Golden Week is about 9 days. Many businesses give employees time off making it a great time to vacation. 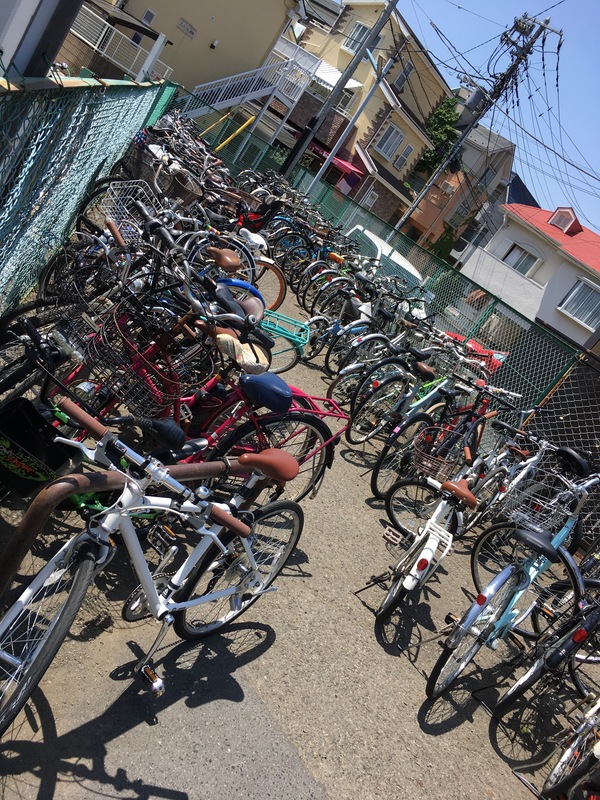 April 29th was Showa Day. Showa Day commemorates the birthday of the deceased Showa Emperor Hirohito, who reigned for 62 years. 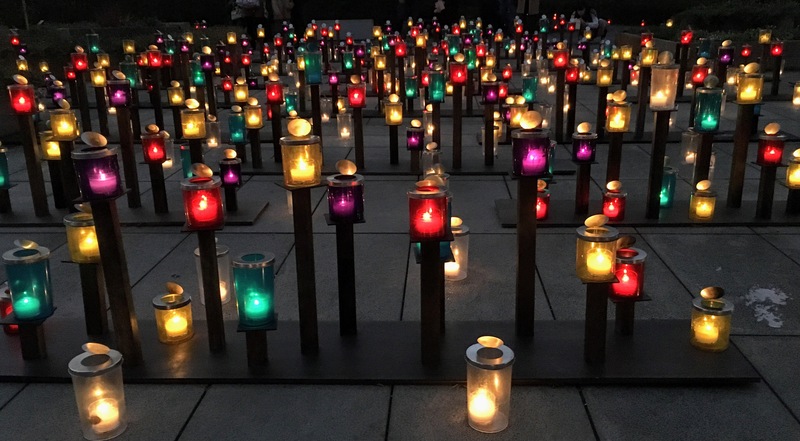 May 3rd is Constitution Memorial Day. 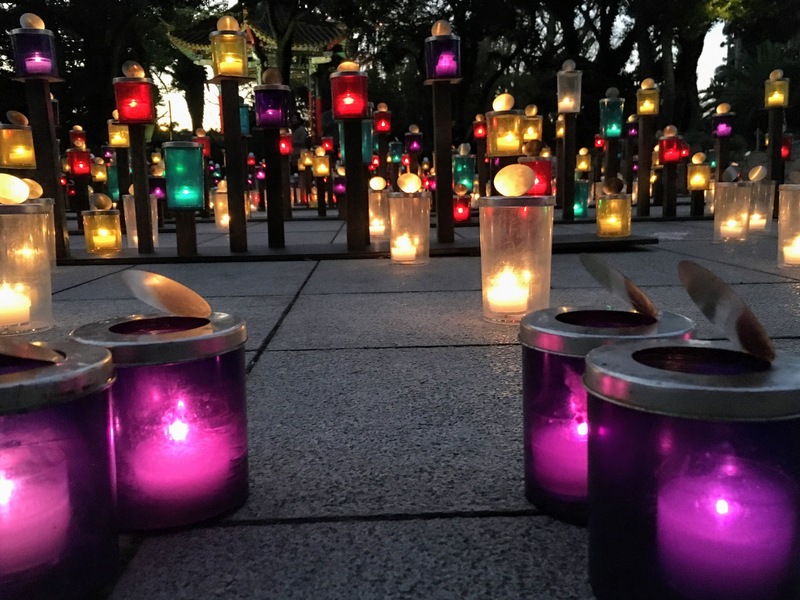 It celebrates the Japanese constitution that came into effect on May 3, 1947. May 4th is Greenery Day. It is a time for the Japanese honor nature. Also, it a time to reflect on the link between humanity and the environment and appreciate nature’s abundant gifts. May 5th is Children’s Day. The day celebrates the health and happiness of children. It was formally known as boy’s day. On this day carp streamers are flown. Carp are a symbol of stamina and strength. We have been warned to be prepared for crowds everywhere. 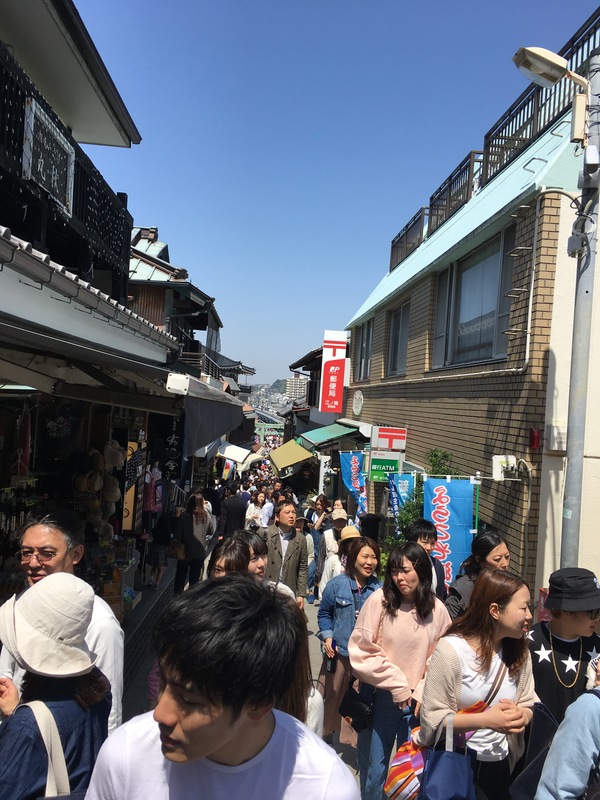 Walking around Shonan Beach and Enoshima, we moved with the masses. My favorite picture was of this surfer finding his own spot to take a nap. Forget the crowds or surf. It’s time to nap! A friend told me about Inamuragasaki Beach. She described it as a beautiful black sand beach with an amazing view of Mt. 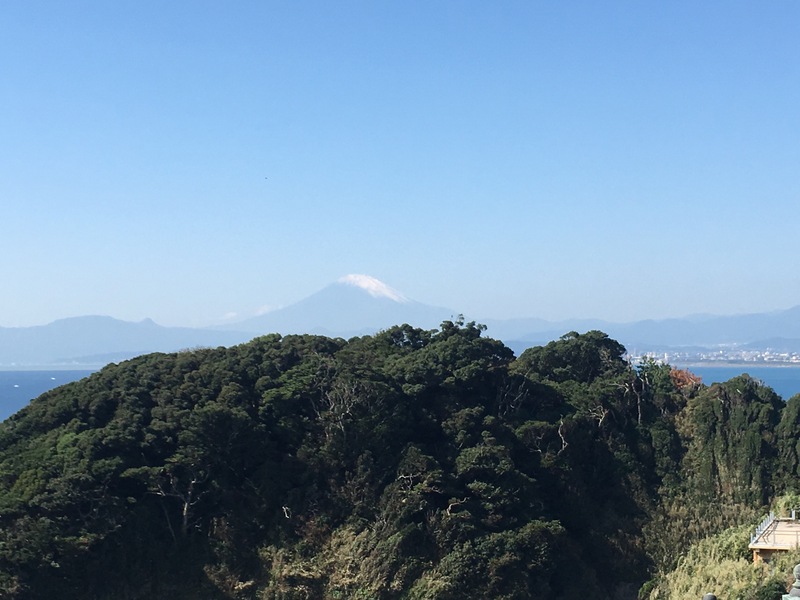 Fuji (on a clear day). 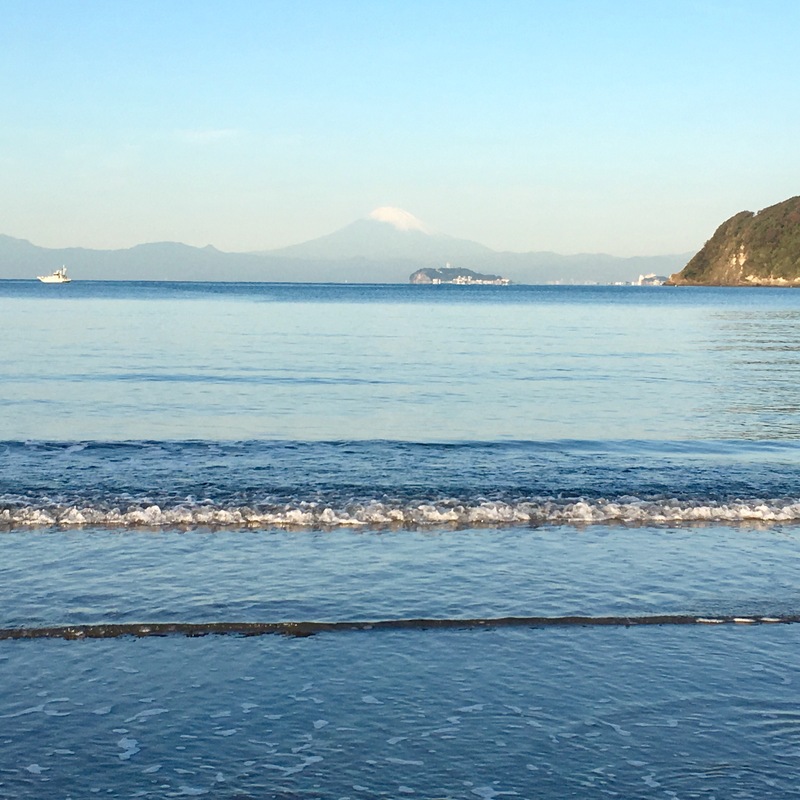 Inamuragasaki Beach is located in Kamakura and accessible by the Enoshima electric train line. Here was my route today. It took about 10 minutes longer to get there than it did to come home. It’s all about train timing! 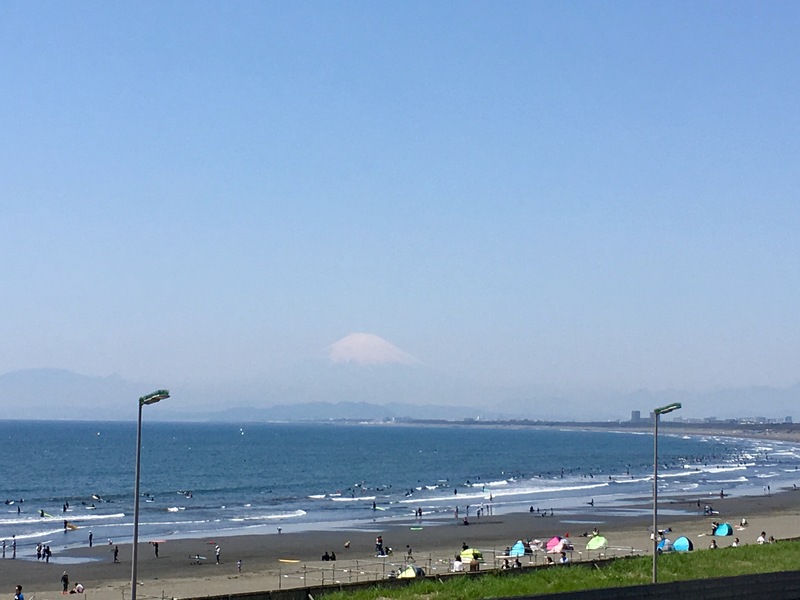 After I arrived in Inamuragasaki, it was a quick walk to the beach to see this view! 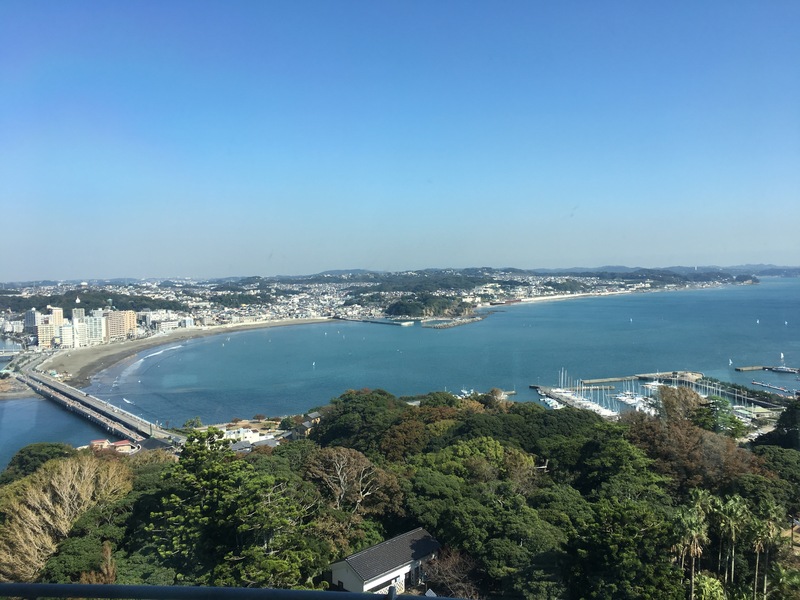 Enoshima Island is the foreground of the picture. A small video to help you enjoy the beach! Despite the chilly sea breeze, I enjoyed my walk along the beach. Nothing brings me more peace than walking along a beach listening to waves crash. There were a couple bridges to cover where streams connected with Sagami Bay. Another reason to love Japan. They build bridges at the beach where drainage may cause your feet to get wet! Inamuragasaki Park is in the distance. 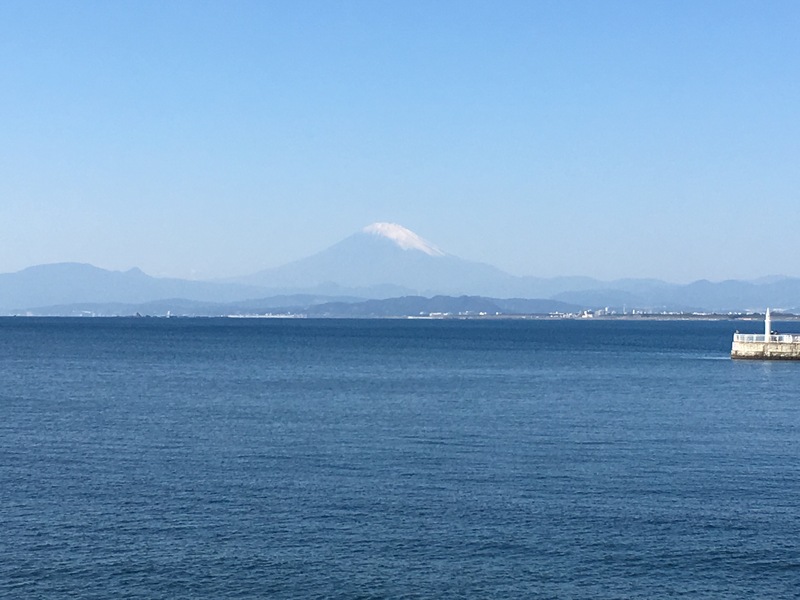 As I continued my walk along the beach to Inamuragasaki Park, I couldn’t resist turning around and snapping another picture of Mt. Fuji. It was such a beautiful day. Simultaneously, as I walked the black sand was strangely beautiful and mesmerizing with the crashing waves. Even on a winter day, the park was lovely. 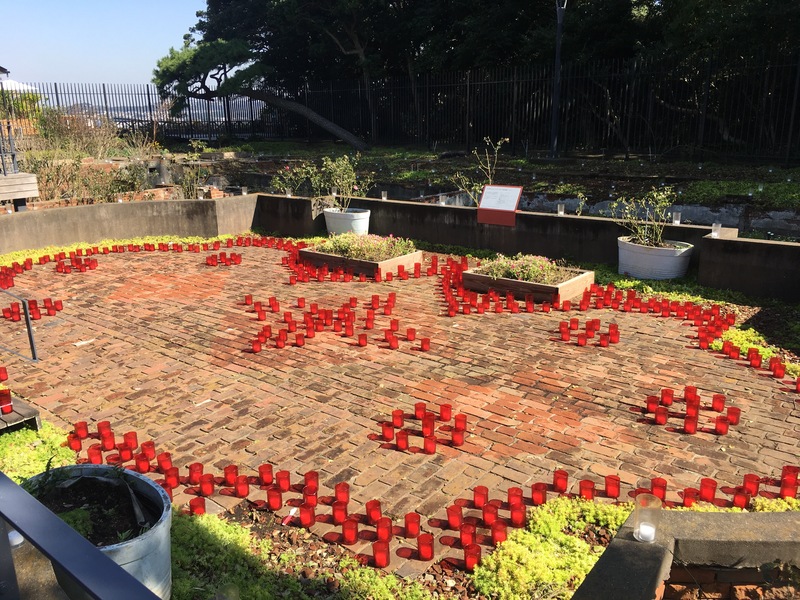 Besides the views, there was a small daffodil garden. The park had multiple levels. 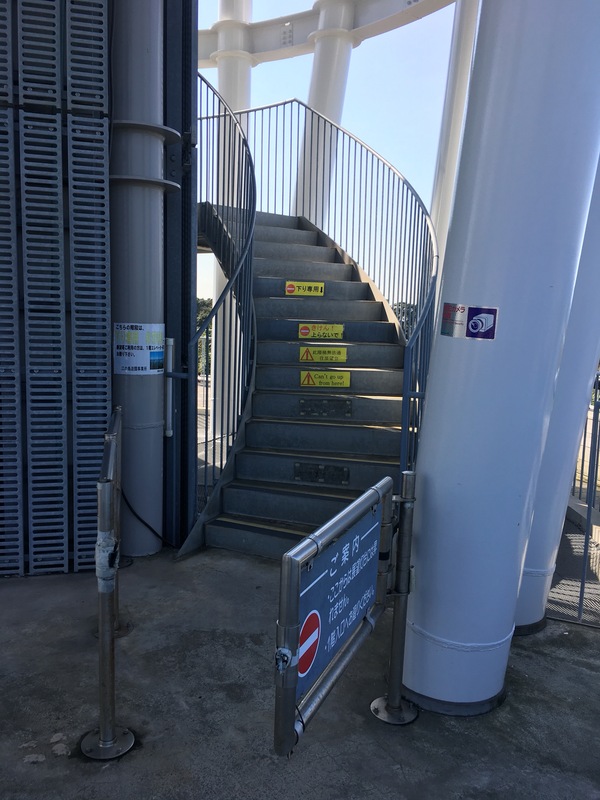 Each connected with stairs, of course! With each level, the view became even more magnificent! The first picture I am standing in front of the statue. The caption wasn’t in English so, I am not sure of the meaning. Interesting statue on the lowest level of the park. I took this picture from the middle level. The trees framed Mt. Fuji nicely. Finally, the view from the top! We can definitely stop to walk the beach and through the park when you visit. There are a couple restaurants I’m interested in visiting as well! 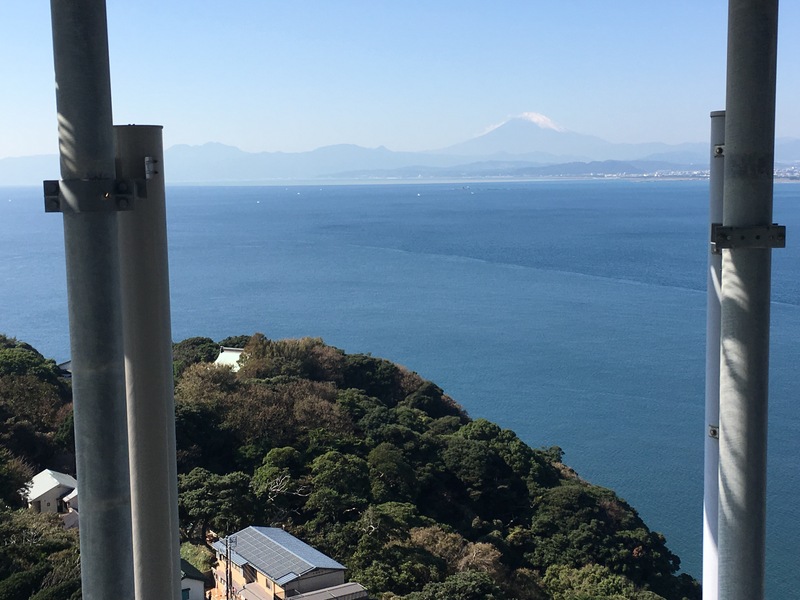 Dave and I ventured out to Enoshima Island today for two reasons. 2. Clear winter skies are the best to see Mt. Fuji. Yes, that’s right. A Maine lobster roll in Japan. It took us 54 minutes and 3 trains. Have no doubt, it was worth it. I’m extra glad we went when we did. According to the sign out front, they are closing Luke’s on January 31st. So, sad. I see at least one more lobster roll in my future. 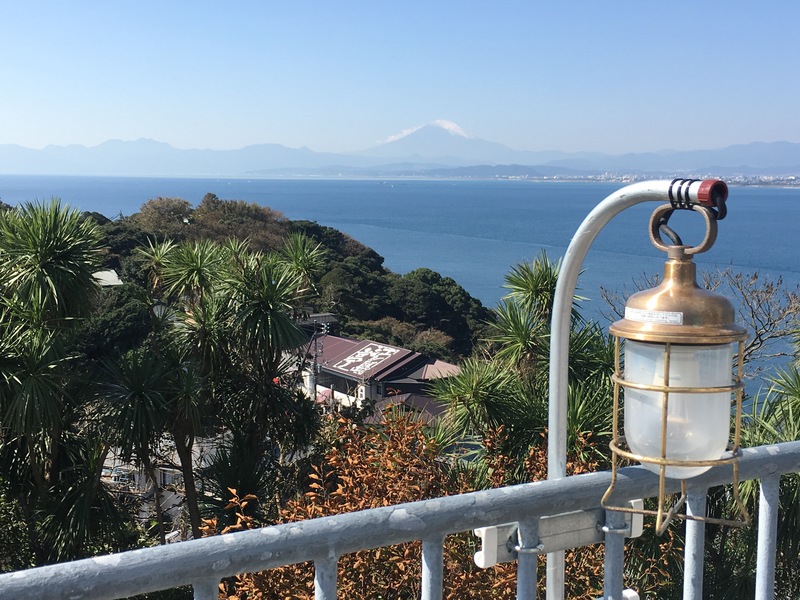 After lunch, we walked over to Enoshima Island to check out Mt. Fuji. And the view was amazing. We have never been able to see the whole mountain, let alone the mountains in the foreground. It was spectacular. Our goal was to see Mt. 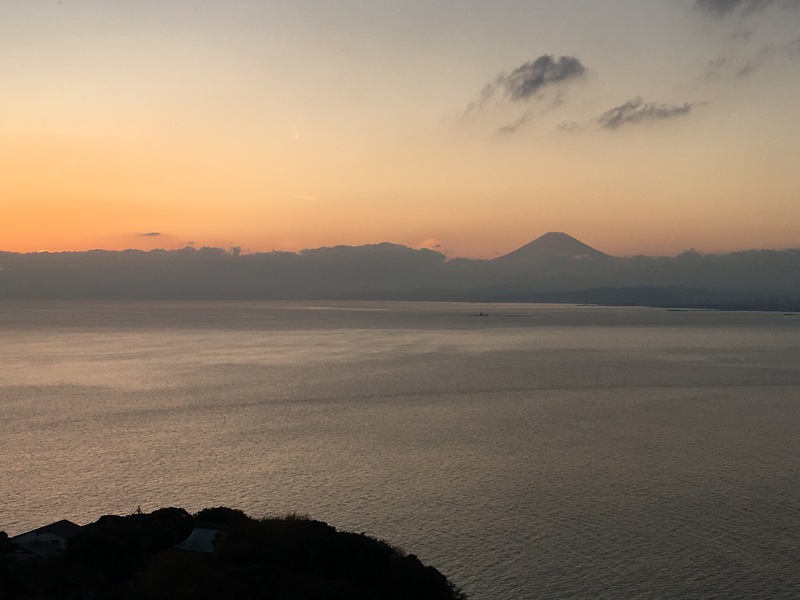 Fuji from the Sea Candle. 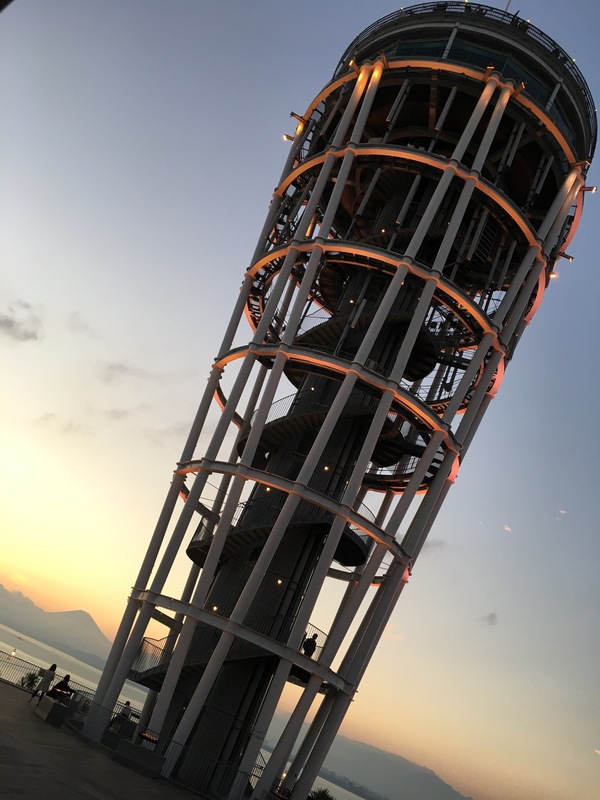 The Sea Candle is the top point in the picture below. 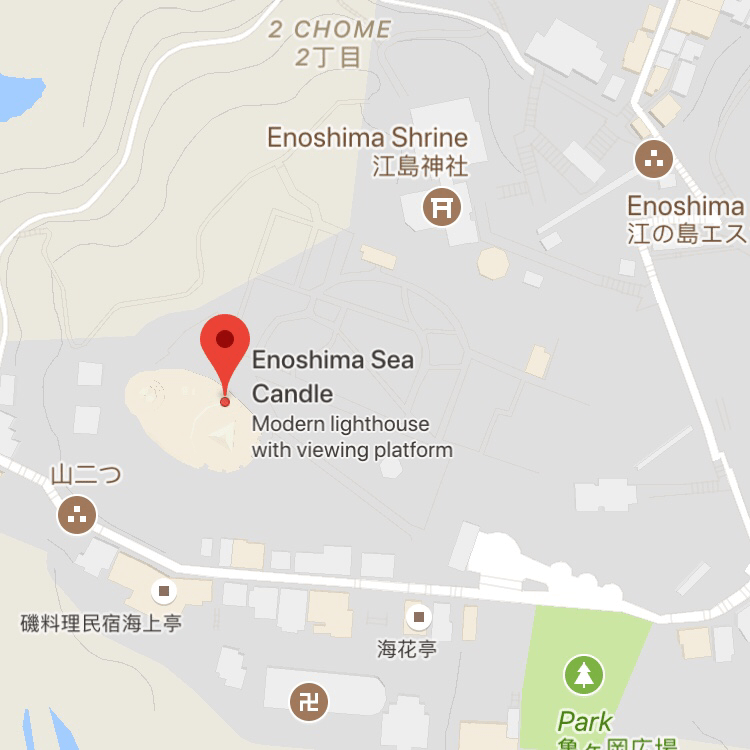 If you remember, Dina and I went to Enoshima Island when it wasn’t clear. Winter in this part of Japan means lots of sunshine, low humidity and clear skies. It might be the best winter I’ve ever experienced. 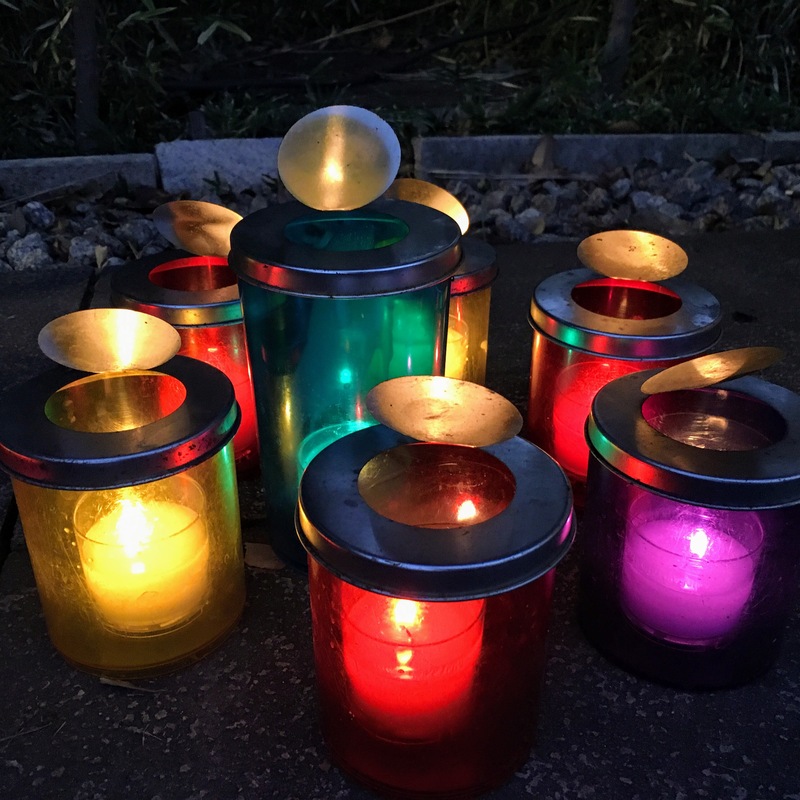 To gain access to the Sea Candle, requires purchasing a ¥500 ticket. 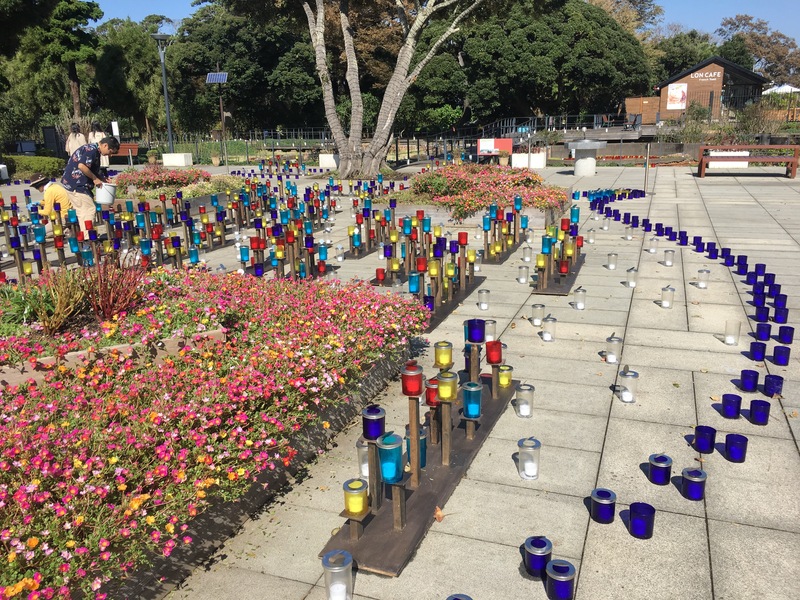 The ticket gives you access to the gardens and Sea Candle. The gardens were a surprise! They were full of tulips! 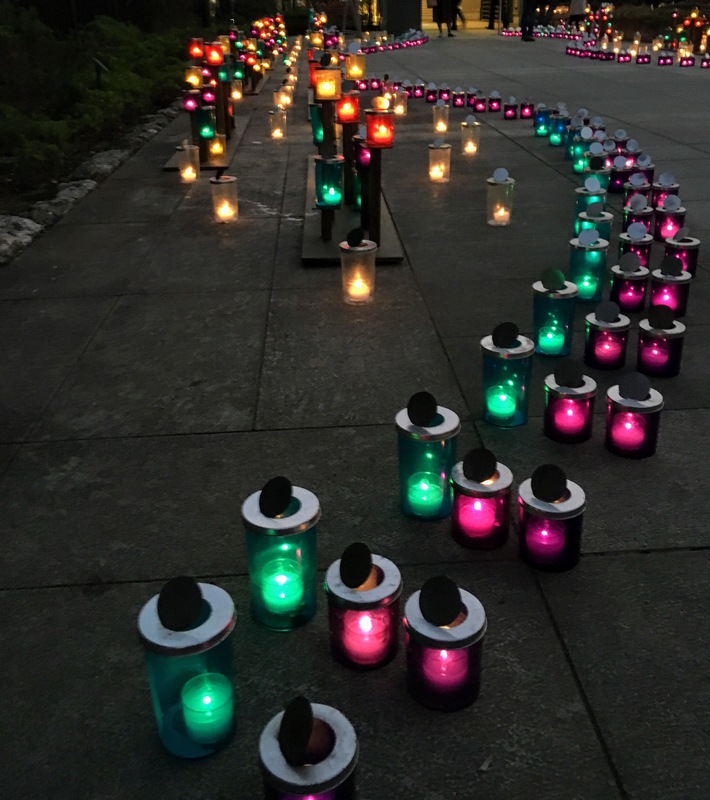 Our trip to the Sea Candle was pretty amazing. This is the clearest we have ever seen Mt. Fuji. I obviously had to take serval pictures. It was just too beautiful. 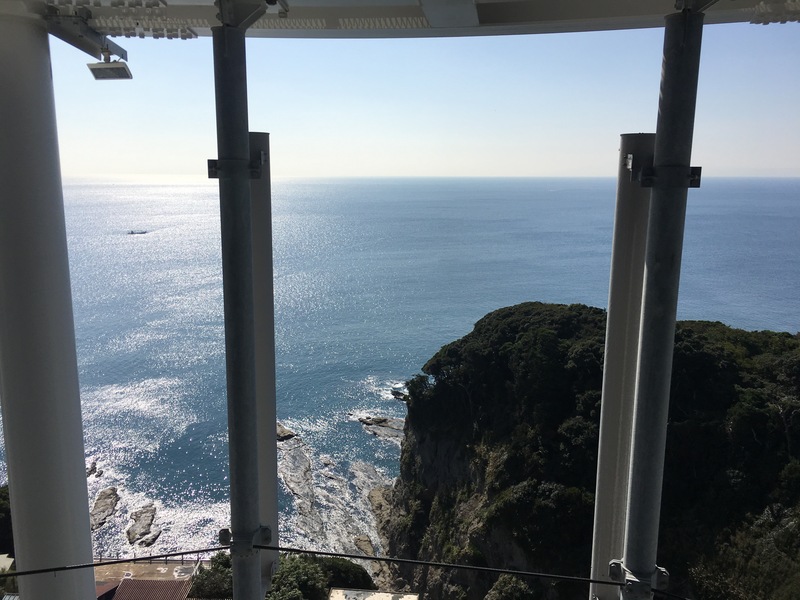 When you visit, we will definitely go to Enoshima Island. We will take the monorail to get there. Here is a quick video from the front of the train. It was like riding the “Big Bad Wolf” at Busch Gardens without the roller coaster effect! Simultaneously, I must help you set expectations. Prepare for clouds. Hope for clear skies. Regardless, it is such a fun area, you won’t be disappointed on our trip! Thinking of something to do on a crisp winter mostly sunny day, Dina suggested we go to Enoshima Island. It is a small island just off the coast. We took 3 trains to get to the island. It took a little over an hour. Here was our route. 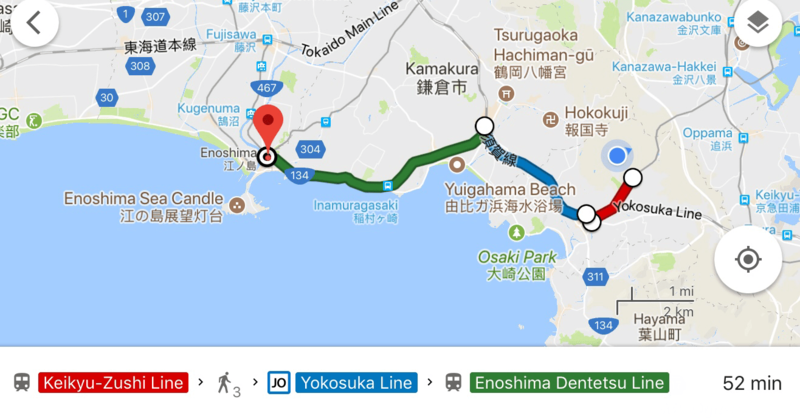 One of the trains is the Enoshima Electric train. The train actually hangs from the tracks. The train was very smooth and quiet. It was a little weird to see other trains hanging from the tracks! 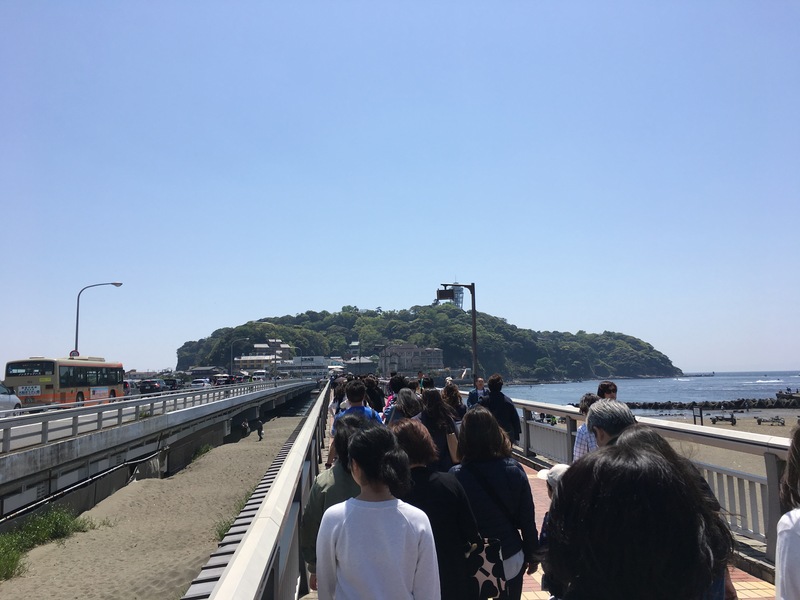 Once we arrived in Shonan, we had a short walk through the town and across a small bridge that connects the island to the mainland. 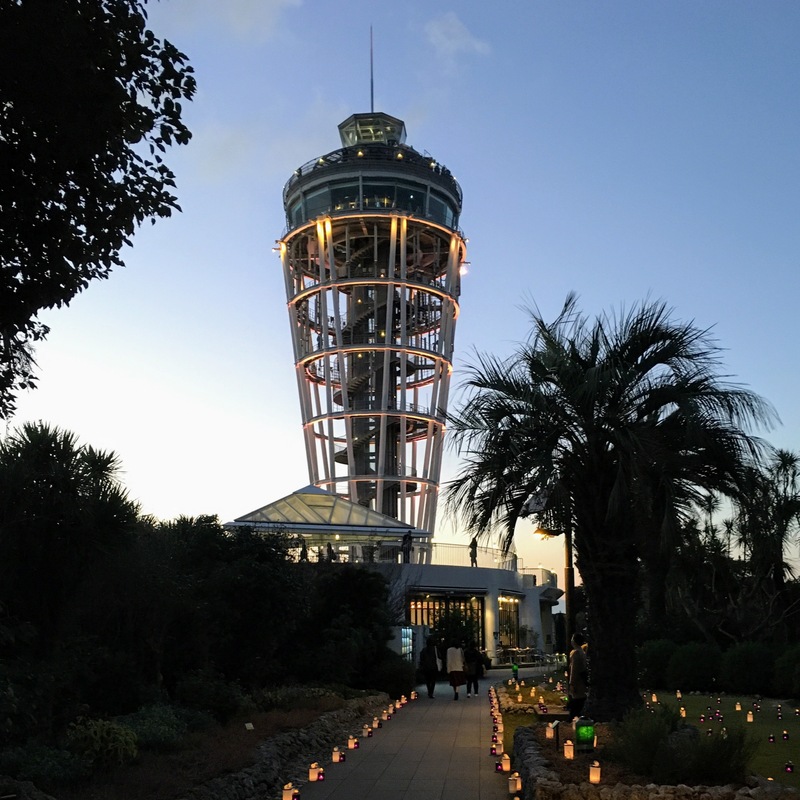 On the island, there are several shrines, a temple, an observation tower (lighthouse / sea candle), lots of cafes, a garden and sea caves. Once you are on the island your mode of transportation are your feet! 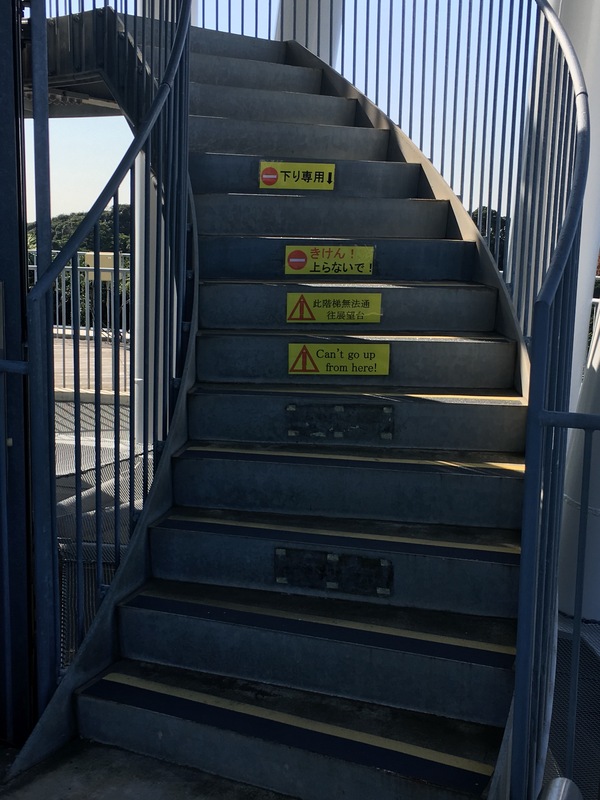 Keep in mind there are a lot of stairs! Oh, and on a clear day, you can see Mt. Fuji. A Torii gate greets you once you are over the bridge and you begin climbing to the top of the island. 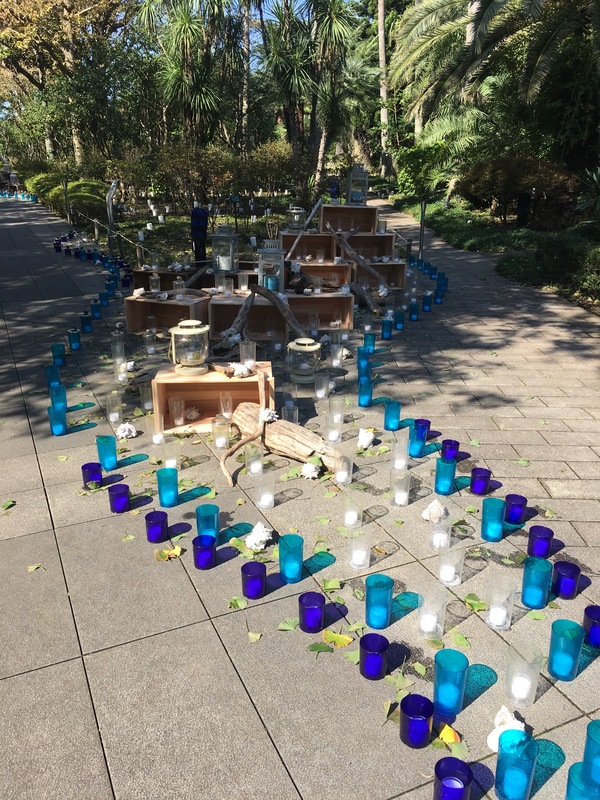 Our first stop was at the Enoshima Shrine. 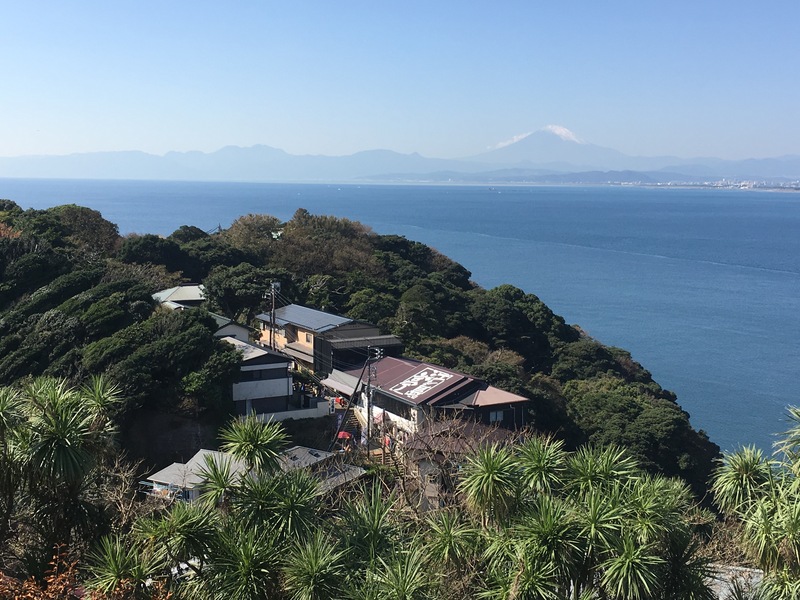 The Enoshima Shrine is a Shinto Shrine dedicated to the worship of the Goddess Benten. Benten is one of the Seven Lucky Gods. Within the Shrine are three shrines: Hatsuno-miya, Nakatsuno-miya, Okutsuno-miya. But first, we must climb stairs. The lanterns are part of the illuminations. I was excited to see the illuminations will last until 2/19/17. There will be plenty of time for Dave and I to return to see the lights. Three pictures that scream “Japan.” A shrine, a fortune wall and a red bridge (over a road – yes, with cars). Up we continue to the Shrine. We had our temple books stamped and continued up the island and up more stairs! We enjoyed a nice view along the way! Our next point of interest was the Sea Candle. I didn’t make Dina go up into the Candle today because it was cloudy around Mt. Fuji. Another reason to return. 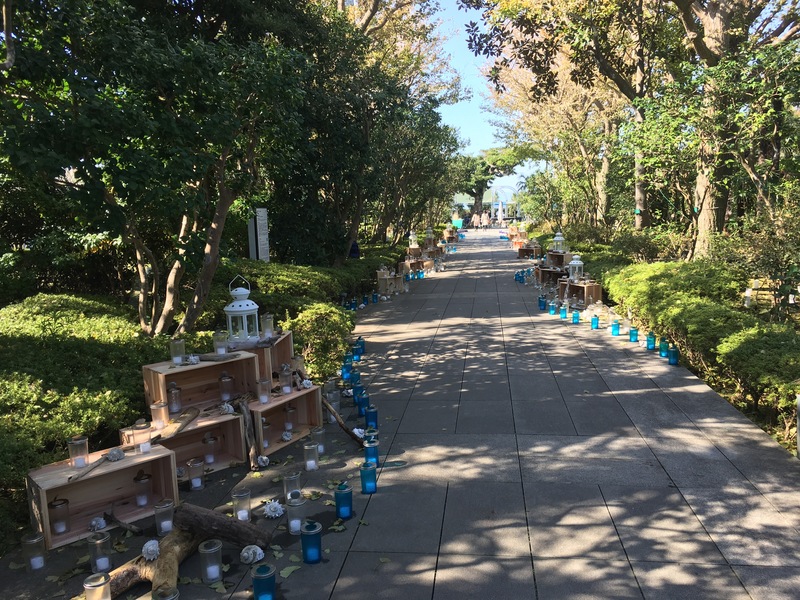 Our next point of interest was the Enoshima-Daishi Temple. Here, Dina returned a fortune she collected earlier this year. Fortunes must be returned to the Temple where they are collected before the end of the year. 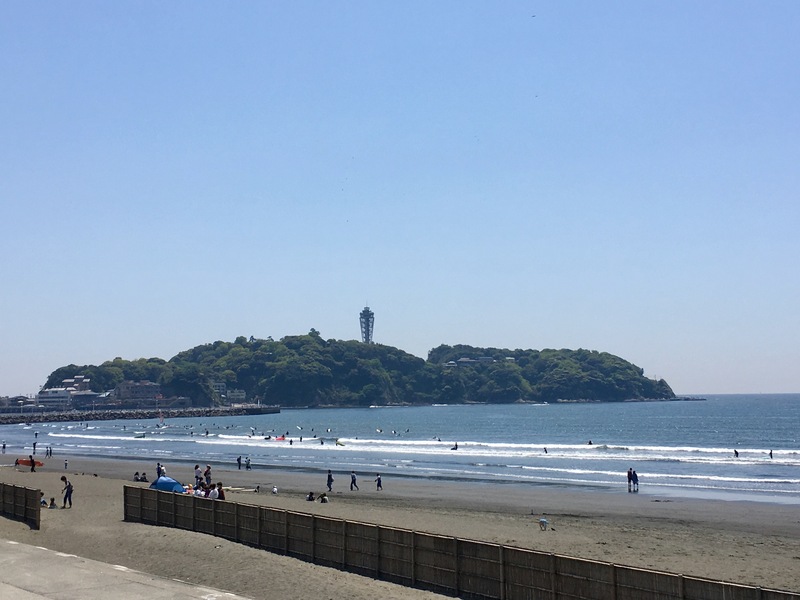 Another reason Dina suggested Enoshima for our adventure today! Within the temple gardens were two statues of Goma, the God of Fire. We had our temple books stamped and continued on our way. Past another shrine with a built in selfie spot. Too bad I don’t have an Apple Watch to click my picture! On we went. This time down the stairs. It was while we were descending, Dina mentioned we had to walk back up all these stairs!! Wait, what!?! Fortunately, there was a nice view even without Mt. Fuji. We could have continued walking along the cliffs and down to the sea caves and tidal pools. We didn’t have enough time today for too much exploring. Another reason for Dave and I to return. We began climbing back up! Finally, at the top we stopped for a snack. “Octopus Cracker” You will have to eat one when you visit. It’s a cracker made out of Octopus. Seriously. Can you see the eyes and tentacles? A very fun and chilly day exploring another beautiful area of Japan. I am excited to go back and see the areas we didn’t have time for and the illuminations! !